We wanted to post a few figures from our testing that show the real selling point of the chips, low power. Idle is around 30W, and maximum power consumption hits just under 105W in our test bed. This is more than some of the other quad-core Intel Xeon E-2174G parts, but also much less than many of the 6-core parts. We can recommend the Intel Xeon E-2174G for extremely power constrained environments like 1A in 110V or 120V rack deployments. For the low-cost colocation world, this is a viable option. Note these results were taken using a 208V Schneider Electric / APC PDU at 17.7C and 72% RH. Our testing window shown here had a +/- 0.3C and +/- 2% RH variance. We double-checked on our 120V racks and stayed within 3W. Thes chips are not released in a vacuum. Instead, they have competition on both the Intel and AMD sides. When you purchase a server and select a CPU, it is important to see the value of a platform versus its competitors. At this point, you would get an Intel Xeon E-2174G over the previous generation Intel Xeon E3-1280 V6 parts and anything lower in the stack. In this market segment, the newer parts are a generational improvement. The Intel Xeon D-2100 series still has some major advantages. The Intel Xeon D-2100 series can utilize higher capacity RDIMMs, has more memory bandwidth, and has 10GbE NICs built-in. It is hard to discount that value. The same comparison would likely apply to the Intel Xeon Scalable family where one gets more clock speed with the Intel Xeon E-2186G but misses on the platform benefits. There is a huge delta in what you can do from a platform perspective on these other platforms. 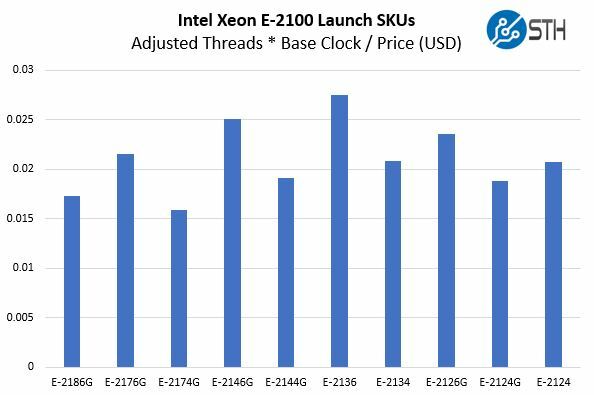 Compared to the Intel Atom C3000 series, the Intel Xeon E-2174G does not have all of the same platform features but is much faster in single-threaded workloads. The larger and more robust compute cores (as seen in our GROMACS test for example), and higher frequencies make this an option for low-cost, low power 1U servers. The decision tree branch that will lead you to the Intel Xeon E-2174G over Atom and Intel Xeon D siblings is the Intel iGPU. The iGPU is not the focus of our CPU benchmark suite, but it includes transcoding hardware support that may be of interest to some deployments with supporting software. One can use BMC graphics for day-to-day management and offload transcoding to dedicated hardware logic not present in mainstream Intel Xeon CPUs outside of the Xeon E-2100 line. If your application can utilize video features or even transcoding offload for Quick Sync video, then the Intel Xeon E-2174G is the option to choose. The bigger question in terms of the rest of the Intel Xeon E-2100 series. Here is the launch pricing just to show the curve. 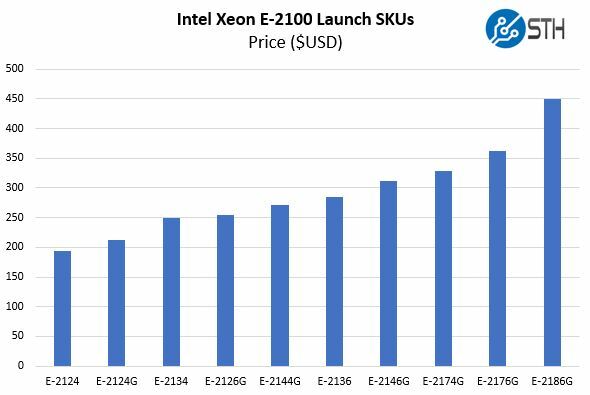 Here the Intel Xeon E-2174G sits between the Intel Xeon E-2146G and Intel Xeon E-2176G in terms of pricing. Those are both six core / 12 thread parts that simply have more performance due to a 50% higher core count. For some further context, here is what the performance per dollar looks like when we use a HT thread as 30% as fast as a normal thread. Using that view, the Intel Xeon E-2174G is the lowest performance per dollar part in the lineup. Our pick in this lineup is still the Intel Xeon E-2146G. If you are shopping for the Intel Xeon E-2174G, take a look at the lower price part with more performance. At the time of this writing, AMD EPYC does not have a real competitor to the Intel Xeon E-2134 for servers. One can use an AMD Ryzen but until we see platforms like the Tyan Tomcat EX S8015 hit the market, and from multiple vendors, AMD’s excellent compute performance with Ryzen 2 is lost by not having platforms with features like IPMI. If someone wanted to use a consumer platform without management, then Ryzen is an option, but the market for that is very small. A year and a half into the Ryzen adventure, the ecosystem is still not picking up the slack. Overall, the Intel Xeon E-2174G is a solid performer. It hands a generational and incremental victory over the Intel Xeon E3-1200 V6 predecessor. At the same time, it is very hard to ignore the fact that one can get 50% more cores, albeit at slightly lower clock speeds, for a few dollars left. Our advice: if you are on the phone with your sales rep, or on the configuration page at your favorite OEM or reseller, pick the Intel Xeon E-2146G over the Intel Xeon E-2174G. Let your competitors who may not read STH be fooled into thinking the higher model number means more performance. The sole caveat here is if you are severely power limited. If so, then you may not be able to handle the higher core count parts and then maybe the Intel Xeon E-2174G makes sense. I’ve been looking at getting an E-2100 for my homelab, but right now these CPUs still seem to be missing from the retail channel. The entry line provides a lot of value for the price. You can opt to fill in one or two of the platform gaps like 10G networking or storage via PCIe and make a strong case against both C3000 and D-2100. 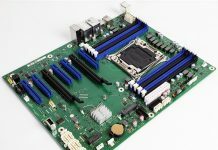 Unless the higher memory capacity is a sticking point, the value dollar probably goes with the E-2100 platform. You need better, or some, proofreading of this article as there are many errors. It’ll be game changer when AMD makes a full push with ECC memory. AMD should enter into this niche of Xeon E and Xeon W. Could it be possible to encapsulate an Epyc of 6 or 8 cores in an AM4 socket? It would be unbeatable in price and performance.